Trust Check Xpert takes BP monitoring to the next level by making it more personal target oriented. Allows to set personalized targets for BP. Each time a measurement is done, the screen color changes indicating whether the reading is within target or not. Makes it easy to differentiate readings within the family. 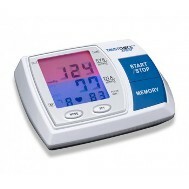 Each user can store upto 40 readings. Detects & Warns in case of any abnormal heartbeats (arrhythmia). To Recieve updates and possible rewards for Arkay Trust Check Xpert please sign in. To Recieve updates and possible rewards for BP Monitor please sign in.